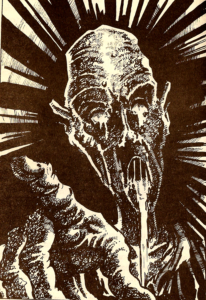 Temple of Terror is one of the FF books I didn’t pick up when I was a kid. Not because I didn’t have the chance to, I had caught sight of it sitting on shelves of second-hand bookshops or in boxes at car boot sales that my grandparents would drag me along to many times, but it’s just simply that it never interested me. I think that’s probably down to the generic look of it. The cover doesn’t really offer much to the imagination, and the title feels very bland. It prescribes very closely to the standard FF title scheme of “(location) of (scary word)”. I’ve managed to dig up a copy of it, and from first glance the only difference between this book and any other Fighting Fantasy gamebook is that this one includes a box for spells. We don’t seem to start off with any spells though, so I suppose we’ll pick up them up along the way! 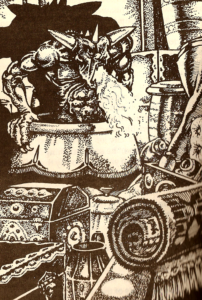 Our adventure in the dwarven village of Stonebridge, not far from Darkwood Forest where you’ve been having a recent adventure in the book ‘Forest of Doom’. As I’m downing my third pint of ale of the evening, our old friend, the wizard Yazdromo, barges in and tells me that the world is doomed. Huh, it must be Tuesday. It seems that the evil warlock Malbordus (whose name sounds like a cheap knock-off brand of cigarettes) is plotting to recover five ancient dragon statues and bring them to life, so that he can raise an army and generally cause a whole lot of mischief – This is the kind of thing that evil warlocks do, you see. Makes you wonder where they get these urges from. Maybe he was spanked too much as a kid or something, I don’t know. Either way, I need to go and destroy the dragon statues and stop him from being a bloody nuisance. Why me? Well, because I have the most well-rounded stats of anyone in the entire village of Stonebridge, with a skill and luck of 10 and stamina of 17. Yaztromo leads me back to his tower, bragging all the way about how amazingly well-respected his magic is and generally being a right royal pain. He then tells me that he’s going to teach me a few spells, for which I should be honoured. I’m strongly suspecting that Yaz is simply making up this entire quest because he’s bored and wants to troll me. Nevertheless he teaches me the spell of understanding any language, creating water, leaping great distances, and making monsters fall asleep. He also gives me some gold, possibly the same gold that I (or any other adventurer) already gave him back in ‘Forest of Doom’ in order to buy his nostril filters, and he sends his crow to guide me to my next destination – Port Blacksand. It’s nice to see references to previous locations here, it really brings the Fighting Fantasy universe together. I manage to barter my way on-board a ship to Port Blacksand, which is still a hive of scum and villainy even after my recent adventures there. The pirate ship is destroyed, leaving me to float away on the wreckage. My stamina plummets to a mere 10 as a result of the attack, leaving me to nom on some of my remaining provisions until I finally drift ashore. Following a successful luck roll, the book tells me that some of my provisions have been waterlogged in the conflict (may have wanted to tell me that before I started eating them), but I was lucky enough to find a coconut in order to help me regain my stamina. This new land is full of palm trees and sand, so I assume that I am on the right track. I head south for a while, until I find a collection of shells on the beach which causes me to imagine that I might run into a terrifying shell monster of some sort if I keep going in that direction, and decide instead to head inland, where I am then attacked by giant flying insects instead. Doh. I dispatch them easily enough with only a few scratches as a result. Continuing inland, I soon stumble across a dead old man laying in the sand, and heartlessly take the gold key that the man’s corpse was clutching because I happen to know that gold keys are the most valuable thing in any Fighting Fantasy book aside from silver swords. It isn’t long before I meet a friendly chap on a camel who offers to sell me some water in exchange for the pearl I recovered from the pirate I killed back in Port Blacksand. I’m tempted to take this offer, until I remember that Yazzy has given me the power to create water from thin air. I expect this will be a rather useful spell, so I bid farewell to the traveller and continue onwards. In the depths of the desert, I encounter the most dangerous of all desert-dwelling entities… a sandstorm! I’m lucky enough to get through it without too much damage, and whilst stumbling around in the dunes I am somehow able to find a brass bell while I’m stumbling around. Ooh, lucky. Even more lucky when I next get to put my create water spell into practice. Now all I need are some friends who can summon fire, water, wind and heart, and we can call upon Allansia’s greatest champion, Captain Planet… sorry. I find my way into a nomad’s tent, and he offers to sell me a whole load of otherwise useless rubbish. Eager to fill my backpack with complete tat, I choose to buy a silver mirror, an onyx egg and a bone flute. Why? Whyever not! Why, an onyx egg has a million uses! If it throw it into the fire, a dragon might hatch out of it, maybe. But probably not. I leave the tent and.. A giant sandworm suddenly attacks. I’m rather confused as to how a giant sandworm with 20 stamina points can launch a surprise attack, much less do anything by surprise, given that it’s the size of one of King Kong’s droppings, but I’ve no choice to fight it. Maybe if I’m lucky, I’ll be able to harvest some spice from it. I barely survive this insanely difficult encounter. From my full stamina score, the sandworm knocks me down to only 5. We are pretty much even throughout the battle, as we both have a skill rating of 10, and right until the very end our stamina scores stay pretty much even, but I’m able to scrape through. 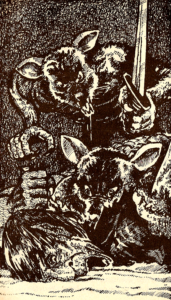 It looks like this is the player-killer combat encounter of the book, because that was just nasty! Either way, I was able to recover a tooth from it – which surely must have been the biggest tooth in the known universe! I wolf down three meals over the course of the next three segments, all the while surviving the cold of the desert’s night. I then catch sight of a small group of trees, with birds circling overhead. In a wonderful display of good luck, I find a cool refreshing oasis full of lovely delicious water. Which I swallow eagerly. Not the most of noble deaths, and it’s sad to know that the world will now be assailed by the villainy of Malbordus and his dragons. I think I got fairly far in this book, although that could be an illusion as the book’s narrative covered a lot of land. 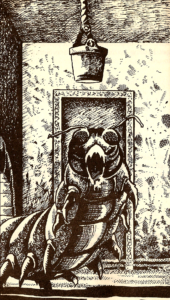 Starting from the forest of doom and heading to Port Blacksand, over the seas and into the desert, it’s a long way to travel and really captures the ‘long epic quest’ feel that a lot of the later Fighting Fantasy books capture. I much prefer those books to the dungeon crawl variety, even though the only difference is aesthetics. It’s a shame to have died by that point, because all logic dictated that the oasis should have been a safe haven to rest up after the sandworm attack. I guess that’s the lesson in a lot of FF books, not to take things at face value. Overalll it’s a shame I didn’t play this book when I was a kid, because it had a lot of things that I’d have rather enjoyed. I’ll group this as a ‘quite a bit of good fun’ category and would encourage people who’ve dismissed it in the past to give it another shot. 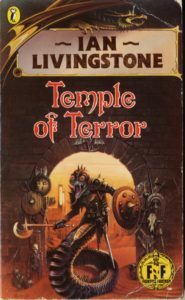 Although the title is definitely a real weak point, ‘Temple of Terror’ simply doesn’t evoke the feel of the book at all. There was, for a start, no temple. At least none that I could find. Maybe ‘Desert of Giant Killer Sandworms’ would have been better. Cause of death: Poisoned desert water.